2015 Updated NOAA Tide Gauge Data Shows No Coastal Sea Level Rise Acceleration | Watts Up With That? NOAA has updated its extensive U.S. coastal tide gauge data measurement records (http://tidesandcurrents.noaa.gov/sltrends/sltrends_us.htm) to include data through year 2015. These measurements include tide gauge data coastal locations for 25 West Coast, Gulf Coast and East Coast states along the Pacific Ocean, Gulf of Mexico and Atlantic Ocean. In addition 7 Pacific island groups and 6 Atlantic island groups also have coastal location tide gauge data measurements updated as well. In all more than 200 coastal locations are included in these measurements with more than 100 of these coastal locations with recorded data periods in excess of 50 years in duration. None of these updated NOAA tide gauge measurement data records show coastal location sea level rise acceleration occurring anywhere on the U.S. coasts or Pacific or Atlantic island groups. In June of 1988 testimony was provided before Congress by various scientists, including NASA’s Dr. James Hansen, claiming that man made greenhouse gas emissions were responsible for increasing global temperatures with the the New York Times reporting (http://www.nytimes.com/1988/06/24/us/global-warming-has-begun-expert-tells-senate.html?pagewanted=all ) “Global Warming Has Begun, Experts Tells Senate”. Its now been 28 years since the conjecture of these early sea level rise climate alarmist claims was presented to Congress. However the latest updated NOAA coastal tide gauge measurement data shows locations likely to experience only inches of sea level rise by mid century (not one to four feet as climate alarmists speculated to Congress in 1998) with that increase consistent with long standing and unchanging rates of sea level rise measured at these coastal locations. The longest NOAA tide gauge data record is at the Battery, New York with a 160 year long measurement period. This location along with all other U.S. coastal locations show no sea level rise acceleration. 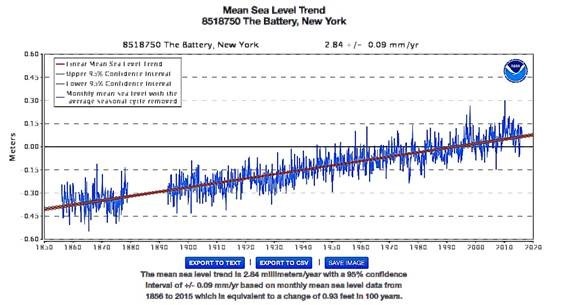 Climate alarmists continue to try and mislead the public by claiming that the Statue of Liberty is in “imminent jeopardy” because of rising sea levels but the unchanging rate of sea level rise present at the Battery would require more than 20,000 years to cover the base (https://wattsupwiththat.com/2013/08/20/national-geographics-junk-science-how-long-will-it-take-for-sea-level-rise-to-reach-midway-up-the-statue-of-liberty/). That time period hardly qualifies as “imminent jeopardy”. Additionally NOAA performs 95% confidence interval analysis of each location to determine if there are significant changes in the tide gauge measurement trends over time. NOAA analysis of these 95% confidence interval ranges is stated as “Although the mean trend may change from year to year, there is no statistically significant difference between the calculated trends if their 95% confidence intervals overlap. Therefore, the most recent calculated trend is not necessarily more accurate than the previous trends; it is merely a little more precise. If several recent years have anomalously high or low water levels, the values may actually move slightly away from the true long-term linear trend”. The 95% confidence interval analysis demonstrates that the linear sea level rise trend is stable and unchanging. This 95% confidence interval analysis is available for all NOAA tide gauge coastal location measurements. Yet Obama had told the country in his Democratic nomination acceptance speech on June 3, 2008 (http://www.huffingtonpost.com/2008/06/03/obamas-nomination-victory_n_105028.html) that we would be able to look back upon his nomination and tell our children that “this was the moment when the rise of the oceans began to slow and our planet began to heal”. Besides the monumental hubris of this statement it is apparent that President Obama was ignorant of the fact that the oceans have been rising for thousands of years since the end of the last ice age. The rates of ocean sea level change have varied significantly over this time period with more recent studies showing greater detail of ocean sea level change information over about the last two hundred years. These changes in ocean sea level have occurred as a result of natural climate events as clearly shown in information (slide #36) from a recent presentation (https://curryja.files.wordpress.com/2016/05/spe-curry-final.pdf) by Dr. Judith Curry regarding global climate science issues. Additionally it is apparent that President Obama was ignorant of the fact that based on more than 100 NOAA long time period measured coastal tide gauge data records coastal locations were shown not to be experiencing acceleration of sea level rise. 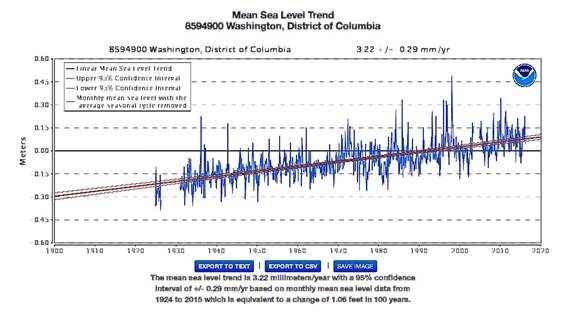 Perhaps President Obama might be interested in the latest coastal sea level rise tide gauge measurement data from Washington D.C. where he has resided for the last 8 years and for Honolulu, Hawaii where he was born. President Obama is not alone in being ignorant about ocean and coastal sea level rise concepts, information and data. Climate alarmist media often carry scientifically flawed stories alleging impending coastal sea level rise catastrophe supposedly being driven by man made CO2 emissions. 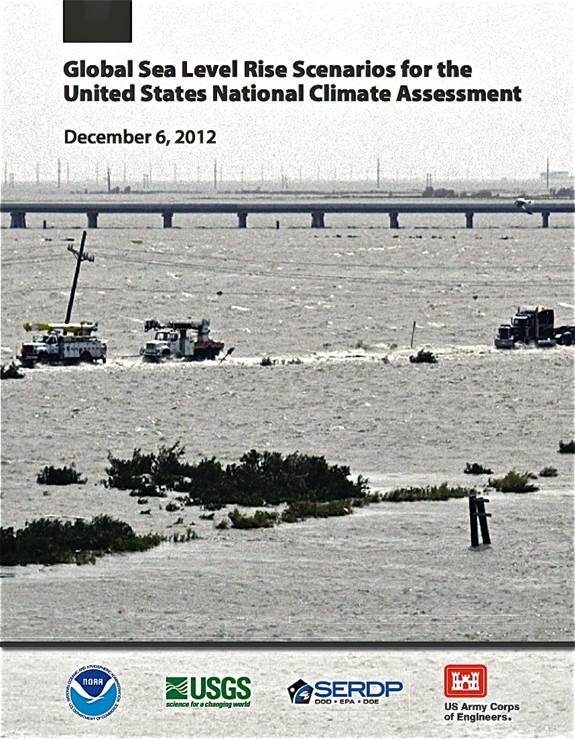 These flawed news reports many times reflect information provided the by Obama Administration national climate assessment effort through the report “Global Sea Level Rise Scenarios for the United States National Climate Assessment” (http://cpo.noaa.gov/sites/cpo/Reports/2012/NOAA_SLR_r3.pdf). This report presents various scenarios claiming that global mean sea level rise by 2100 will range between 8 inches to 6.6 feet. The mid range of the scenarios is about 3 feet of global mean sea level rise by the year 2100. “Scenarios do not predict future changes, but describe future potential conditions in a manner that supports decision-making under conditions of uncertainty”. “Probabilistic projections of future conditions are another form of scenarios not used in this report because this method remains an area of active research. No widely accepted method is currently available for producing probabilistic projections of sea level rise at actionable scales”. “Thus, specific probabilities or likelihoods are not assigned to individual scenarios in this report, and none of these scenarios should be used in isolation”. Exactly how local communities and cities are supposed to use these scenarios for local sea level rise “planning” purposes given these incredible limitations is unexplained. Also unaddressed in the “National Climate Assessment” report is any explicit discussion of the huge difference between “global mean sea level” and “local sea level” (also called relative sea level) concerning how these vastly different sea level rise data measurements apply or don’t apply at specific coastal locations. .
NOAA clearly notes (http://tidesandcurrents.noaa.gov/sltrends/faq.htm#q1) that “There is an important distinction between the global sea level trend and relative sea level trends (based on local sea level measurements), which must be understood in order to interpret changes to a coastline or particular location, and to properly apply the information”. 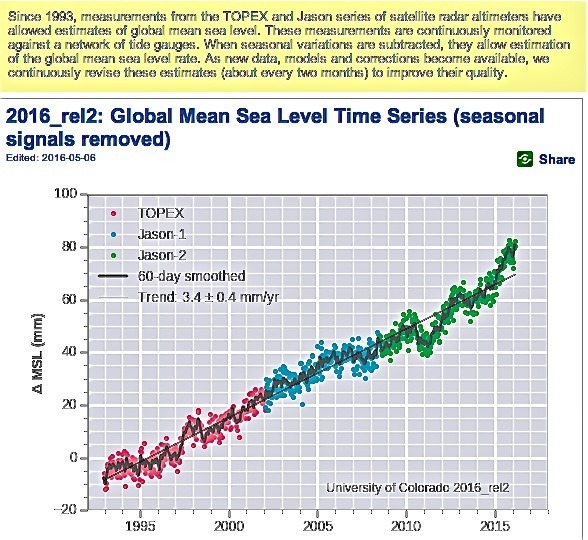 The University of Colorado sea level research group which uses satellites to measure global mean sea level for making estimates of ocean sea level clearly states ((http://sealevel.colorado.edu/faq#n3134)) that satellite global mean sea level measurements “”cannot be used to predict relative sea level changes along the coasts”. For sea level rise planning purposes local coastal cities and communities need to rely upon NOAA tide gauge data with measurements of coastal sea level rise at specific local and related regional locations to address what kinds of sea level increases should be expected. Global mean sea level data and estimates are not applicable at specific coastal locations and inappropriate for use for local coastal planning purposes. Southern California has some of the world’s most beautiful and expensive coastal communities on the planet including locations at Long Beach, Seal Beach, Huntington Beach, Newport Beach, Corona del Mar, Laguna Beach and Monarch Beach. The rate of sea level rise at these coastal locations is very important to these communities economic well being and to issues of property protection and enjoyment for the businesses and people that work and live in these communities. A local newspaper the Orange County Register published two articles on April 24, 2016 (http://www.ocregister.com/articles/sea-713335-rise-level.html), (http://www.ocregister.com/articles/focus-713037-levels-rise.html) alleging that because of CO2 caused global warming the earth’s sea level rise is accelerating and could increase by 3 feet by the year 2100 and inundate local southern California coastal areas causing significant damage to Southern California coastal communities. These stories based their sea level rise information on the “National Climate Assessment” report and incorrectly applied the mid range scenario to Long Beach, Newport Beach and Huntington Beach. Additionally the articles failed to make any mention of the huge qualifications and limitations of the National Assessment reports global sea level rise scenarios. There are four NOAA long time period tide gauge sea level rise measurement locations in the Southern California region located at San Diego (http://tidesandcurrents.noaa.gov/sltrends/sltrends_station.shtml?stnid=9410170), La Jolla (http://tidesandcurrents.noaa.gov/sltrends/sltrends_station.shtml?stnid=9410230), Los Angeles (http://tidesandcurrents.noaa.gov/sltrends/sltrends_station.shtml?stnid=9410660) and Santa Monica (http://tidesandcurrents.noaa.gov/sltrends/sltrends_station.shtml?stnid=9410840). The NOAA tide gauge data for these locations which covers time periods from more than 80 to over 100 years ago through 2015 data measurements shows that there is no sea level rise acceleration taking place at these locations and that the rate of sea level rise is stable and between 3 to 9 inches per century at these locations not the 3 feet proclaimed in the alarmist article. This NOAA tide gauge data should have been discussed and presented in these Register articles. NOAA 95% level of confidence analysis shows that there have been no significant changes in the rate of sea level rise at these Southern California locations during the long time period of these measurements. These 95% level of confidence intervals for the specific Southern California coastal locations are available at (http://tidesandcurrents.noaa.gov/sltrends/sltrends_update.htm?stnid=9410170), (http://tidesandcurrents.noaa.gov/sltrends/sltrends_update.htm?stnid=9410230), (http://tidesandcurrents.noaa.gov/sltrends/sltrends_update.htm?stnid=9410660), and (http://tidesandcurrents.noaa.gov/sltrends/sltrends_update.htm?stnid=9410840). The climate alarmist news media have done a terrible job addressing the valid issues and information about sea level rise acceleration to the public. Much of what is written about this topic is inaccurate, misleading and erroneous. 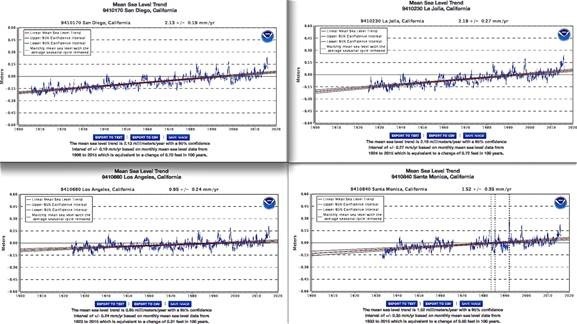 The media appear to have gone out of their way to ignore NOAA tide gauge data and instead incorrectly based alarmist sea level rise stories on inappropriate use of global mean sea level measurements and computer estimates and forecasts. A recent study published in the Ocean & Coastal Management Journal (http://www.sciencedirect.com/science/article/pii/S0964569116300205) addressed the importance of using only tide gauge data for coastal planning not speculative global mean sea level estimates derived from ocean computer models using satellite sea level measurements. The network of tide gauges provides the only information of value for costal planning. The worldwide naïve average of sea level is +0.24 mm/year with no acceleration. The climate models have crucial flaws making them useless. Planning schemes must only reflect the proven local and global historical data. Further supporting the importance of using local sea level rise tide gauge measurements for coastal location planning needs NOAA clearly states that “Relative Sea Level Trends reflect changes in local sea level over time and are typically the most critical sea level trend for many coastal applications, including coastal mapping, marine boundary delineation, coastal zone management, coastal engineering, sustainable habitat restoration design, and the general public enjoying their favorite beach”. Unfortunately misleading, erroneous and inaccurate information about sea level rise issues is often used by climate alarmists to try and make their case. Extensive NOAA tide gauge data measured at hundreds of coastal locations around the U.S.many with measurement periods longer than 100 years do not support claims of coastal sea level rise acceleration. NOAA tide gauge data represents an extremely important scientific resource to address specific coastal location sea level rise issues. The real story about coastal sea level rise contained in this critical data needs to be told. May 28, 2016 in Sea level. 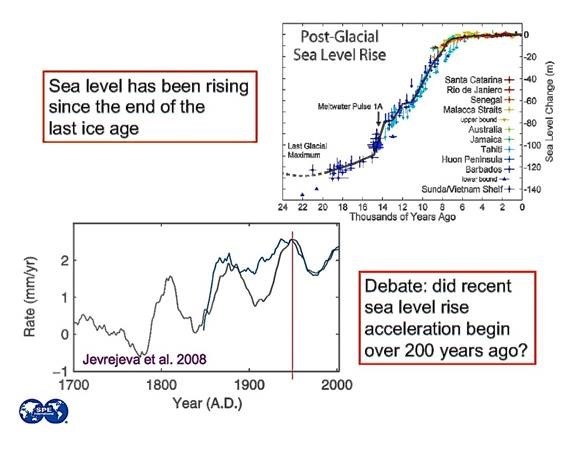 But wait…don’t I espy a Mannian hockey stick at the end of the graph…Obviously sea level rise is going to soon drown all coastal installations!! 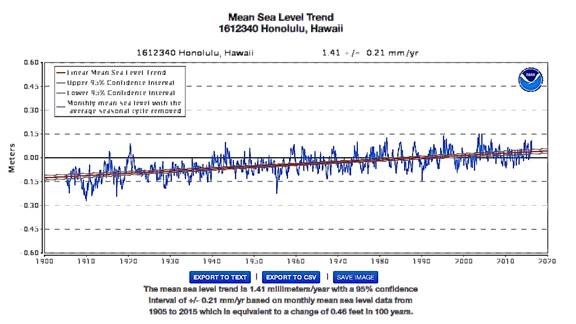 The Honolulu tide guage shows an average trend of 1.41mm/y over 110 years of record. The Jevrejeva graph also despite showing very strong 60 y cycle also shows the lastest peak to be lower than the previous one. That also is DECELERATION on a global scale. This is all derived from tide gauge measurements. Boulder Colorado and signed up members of the Exploding Earth Society. There data does NOT represent actual water levels and intentionally so. Why does a global MSL index get an “inverse barometer adjustment”? The also do their GAIA [sic] adjustment based of totally speculative deepening of the oceans. The whole idea of extracting sea levels even to the nearest mm by measuring the trough of the swell if facial. They can produce whatever long term trends want by playing with parameters. It’s tide gauges that provide ground truth and the truth is that Boulder Colorado data is a lie. The global sea rise trend, for what its worth, also shows deceleration although It is clear that 24 years of data is not very relevant. The rate of sea level increase from 1993 to 2003 is higher than from 2003 on. I’m just eyebolling the data but I’m pretty sure if one was to fit a quadratic curve it woud have a negative quadratic coeficient. Weather is highly variable with space and time and as well with climate system and general circulation pattern. Temperature is part of the weather. — in the past few days in Hyderabad where I am living presented high fluctuations in temperature maximum with changing relative humidity factor. We integrate such weather over a region, nation and finally global. However, the integrated factor is biased by spatial distribution of the met network. In the case of oceans that covers two-thirds of the globe the measurements of realistic nature are available only after 1990. That means in both space and time the integrated weather or temperature is biased by network distribution over space and availability of data over time. Thus, the integrated global average temperature anomaly is biased by several factors, which are not known. In such a system we presume global warming component qualitatively under the system of “Settled Science”. Using such qualitative jargon, sensational pronouncements are made such as ice melt leads to sea levels rise leads to inundation of coastal zones leads to —, etc. Before making such hysteric conclusions or inferences that severely affects the economy – big business for insurance companies. On the USA West Coast, the historical factors that are affecting the sea level are primarily the earthquake and volcanic/tectonic activity. We need to under this factor on sea level changes. There are several other secondary factors like drilling for oil, gas, water, etc. In the case of countries like India in addition, the major factors that are contributing to sea level changes are man’s greed. They are destroying the coastal zones. This inundating the coastal areas in high tides associated with severe cyclonic activity. Over a period of time they present a pseudo sea level change. Before we assess the sea level changes [rise or fall or no change] we must separate the causes and effects. Then only it has some value. Looks to me like about 6” (inches) per century, on average – Big Whoop! Sooner or later – hopefully sooner – they will “pull” the “National Climate Assessment” from the shelves and replace it with something of value. The December 6, 2012 “Scenarios” document will be heralded as evidence of the climate lunacy that permeated the Obama Administration. Obama WILL be remembered for his actions on climate – just not in the way he pathetically imagines!!! Why I cannot find the updated versions, I followed the link but it still shows the old data. At Fortress Louisbourg there is a tide marker from 1743 which indicates that the tide has been rising (relative to subsiding land) at around 30-50 cm/century for at least 270 years. This suggests that the rate of increase has been decreasing. When Al Gore and his Hollywood buddies sell their beach side properties , then people might start to worry. It is too late. The damage is done. Everyone you talk to seems to believe the seas have risen exponentially. When you simply state that there has been no acceleration of sea level rive in the past 150+ years, they look at you like you are crazy. How do we get this information widely disseminated? You look them square in the eye and calmly say “No, that’s wrong. NOAA just released their updated sea level rise info and there is no such danger.” Then give them the URL and tell them to see for themselves. People respond positively to plain statements of fact when presented that way. Usually by calling you a flat earth climate denier. When that happens, I change the subject and explain that by hanging a 2 lb. lead fishing weight from their Johnson, over the course of a year or two they can re-grow their foreskin. I doubt very much that the people who believe all this nonsense even know what exponentially means ! Economists and governments are always claiming to be aiming for a optimum of 2% per year. But a “stable” sounding 2% per year is not stable. It is an exponential growth, which will double everything in 35 years. Don’t be fooled into thinking that “stable” growth is stable. It’s not, it is explosive. You’re undoubtedly correct. So maybe the first thing to do with these people is to ask them to define their terms. Then explain to them what they’re actually saying. I think that keeping it simple is a good way to get the message out. I mention that the global average has been around 2.5 to 3 mm per year, and then add that the rate would have to increase around 250% to 7mm per year to end up with a 2 foot sea level rise by 2100. “Therefore, the most recent calculated trend is not necessarily more accurate than the previous trends; it is merely a little more precise. If several recent years have anomalously high or low water levels, the values may actually move slightly away from the true long-term linear trend”. 2 —used to refer to an exact and particular time, location, etc. Accurate and precise are synonyms. So if something is more precise then it has to be more accurate. Or is there something about the use of such terms in science or math that I am not aware of? Rah: I’ve always liked the pictorial explanation of precision and accuracy in scientific measurement. They are not the same, there is a difference. As far as scientific measurements are concerned, accuracy and precision are different. I have a digital thermometer at home. It has an LCD display that reads to one tenth of a degree Celsius. So, we say that this instrument measures temperature with a precision of one tenth of a degree. If the temperature were to rise or fall by more than one tenth of a degree, the instrument would detect that. In truth, I have several thermometers of the same type; all display values to one tenth of a degree. However, when placed next to each other, they don’t all display exactly the same temperature. Deviations of up half a degree are typical. So, although they display temperatures to a precision of 0.1 of a degree, I know that at least some of them are not accurate, i.e. some of them are not telling the ‘true’ temperature. Well, to use a gun analogy. If you can make a 2 1/2 inch group you are fairly precise. If the group is centered on the target you are accurate as well as precise.. If the group is centered 3 feet to the left you are merely precise. Precision without accuracy means precisely nothing. Without accuracy you merely kill the back wall or other people’s targets. If the group is centered to the left 3 feet and more than 12 inches across you should find a sport you are good at. marked by exactness and accuracy of expression or detail. (of a person) exact, accurate, and careful about details. used to emphasize that one is referring to an exact and particular thing. Accurate and precise are not synonyms. Precision is a measure of how tightly grouped a series of measurements are. Accuracy refers to how close a measurement is to an accepted or known physical parameter (the “correct” answer). Imagine a bullseye on a target. If you shot the target 10 times and all 10 shots hit the bullseye, you would be both an accurate and precise shot. However, if you hit the target with all 10 shots in the lower left portion of the target (or anywhere else but still tightly grouped) but missed the bullseye altogether you would be a precise but inaccurate shot. Yes, and another 10 shots, equally spread around the perimeter of the target would be imprecise (not tightly grouped), even though the average (dead center) was highly accurate. In healthcare the criteria for a test to be useable is a) must be sensitive, b) must be specific and c) must be meaningful. There are boatloads of tests which are both sensitive and specific, but most flounder on the ‘meaningful’ tag. A ploy often used by Pharma but rarely noticed by John Q. Public. Unfortunately, climate science has taken ‘footloose and fancyfree’ to a new level. Thank you all for your replies and explanations. I understand now. Carbon500 your target graphics did the trick best for me. Easy for this former SF soldier to understand shot grouping. Assuming the weapon used is reasonably accurate. Target one indicates a combination of shooter errors. Target two indicates good shooting fundamentals but the weapons sights need zeroed. Target three indicates proper technique and sights zeroed in. The other day I was at the range and a guy asked me to try his Mosin Nagant Sniper Rifle with a red dot sight and nice tactical stock. I put three rounds down range at 300 yards and then we checked. My three shot grouping could be covered by a nickel but it was in the high left in the 5 ring. So while my shooting was precise it was not accurate because the sight was not zeroed for me. Sorry target FOUR indicates good technique and sights zeroed. At 300 yards with a red dot sight. A red dot that could be anywhere from 1mm to 3.5mm in diameter, optically covering much of the target. Your shooting was accurate and precise. As accurate as the sights and rifle could be expected to perform. Yes, you could possibly align the optic to your vision better, but that is impressive shooting with a red dot at 300 yards. Old SF guy, simple analogy to shooting a target. Neither accurate not precise is all over the target. Precise is a tight grouping somewhere on the target. Accurate is a loose grouping on the 10 ring. Accurate and precise is no 10 ring left. Sorry guys, but I find the use of the word precise for a consistently inaccurate aim ridiculous. Or to put it somewhat different, to call a measurment precise when someone makes a consistent error a misnomer. Feel free to find it ridiculous, but it is the standard definition taught in all scientific education. Wikipedia has a good explanation. You, of course, don’t have to accept this definition, but your refusal will probably disqualify you from being taken seriously in most scientific conversations where precision and accuracy are hot topics. According to ISO 5725-1, the general term “accuracy” is used to describe the closeness of a measurement to the true value. When the term is applied to sets of measurements of the same measurand, it involves a component of random error and a component of systematic error. In this case trueness is the closeness of the mean of a set of measurement results to the actual (true) value and precision is the closeness of agreement among a set of results. Luke, what I read on your Wiki link is that “precision is the closeness of agreement among a set of results” That says nothing about the systematic error in a set of measurements (or a systematic error in target shooting, as given as an example here). Systematic error are sources of error due to something being wrong. In the case of shooting, the gun not being properly sighted is a case of systematic error. The wrong result you’re getting is because of the system and not a random factor. oops… Hit submit on accident. The systematic error goes to accuracy. Doing it wrong every time, usually gives a wrong result. Not always. If your precision is +\- 1 inch and your accuracy is a half inch off the target, then at least a portion of your shots will be correct. However if your precision was +\- 0.25 in, you would always be wrong if the same half inch systematic error was there. NOAA would rather obscure the measurements using terms like “accurate” and “precise” instead of publishing statistical confidence levels. They are learning from the IPCC. I’m sure others will respond better than my feeble attempt, but “accurate” means how close to the true value, and “precise” means how close together the measurements are. In target shooting, “accurate” would mean how close to center, and “precise” would be how well-grouped they were. James, agreed. The catch is that there is no target value known in advance; the purpose of the measurement is to determine it. That’s where standard deviations should be used. I think of accuracy as how close to the bullseye, and precise as the size of the bullet. It’s easier to hit a bullseye with an 18 inch shell than with a .22 bullet. Where does reproducibility come into the picture ? Most “results” should have been published in The Journal of Irreproducible Results. Accurate and precise are not synonyms. You might be aiming for the bullseye but put all your darts into the double 20. That’s precise, but not accurate. Throw another 5 darts aimed at the bullseye. One hits the bullseye, the others the 3, 6, 11 and 20. Average the location of all the darts and it’s the bullseye. That’s accurate but not precise. rah: Accurate and precise are synonyms. It is accurate, but not precise, to say pi is equal to 3 . It is precise, but not accurate, to say pi is equal to 2.7182818284590452353602875 . It is accurate and precise to say pi is equal to 3.141592653589793238462643383279502884197169399. …im real terms, digital thermometers are more precise because they can yield temps to 2 significant figures. It doesn’t at all mean that a digital thermometer is more accurate than analog. This is a constant play on words by climate pros. Has led to the bold assertion that ‘this is the hottest year on record’ many times by ,02 degrees when the equipment is not in any way accurate with such a measure. No, they are not synonyms. Accuracy refers to the error margin for a number. Is the number accurate to 1% or 10%. Precision refers to the number of digits that are recorded. As an example: A series of numbers can be 999, 997,1002, 998, 999, … Those have three digit precision, but each may only be accurate to ± 2% or worse. Another series of numbers may be 99, 100, 98, 99, 100, … Those have 2 digit precision, buy may be accurate to ±1%. An instrument can be mis-calibrated by a large percentage and still give 3-digit precision. Only half of the story. Are the tide gauges being lifted or sunk by movement of the earth beneath them? For the Battery Park instrument, satellite measurements show it is sinking at a rate of 1.5 to 2 mm/year (if I read it right). So the sea level increase is closer to 1.5 mm/yr, the rest being subsidence. You can find the info at PSMSL.org. Great article. One of my sons has just spent an eye watering sum on a beach front property on Oahu so I sent this along with the tide gauge graph for Honolulu. How are Coastal Land Prices doing? Well, people in Miami are certainly taking this seriously…. 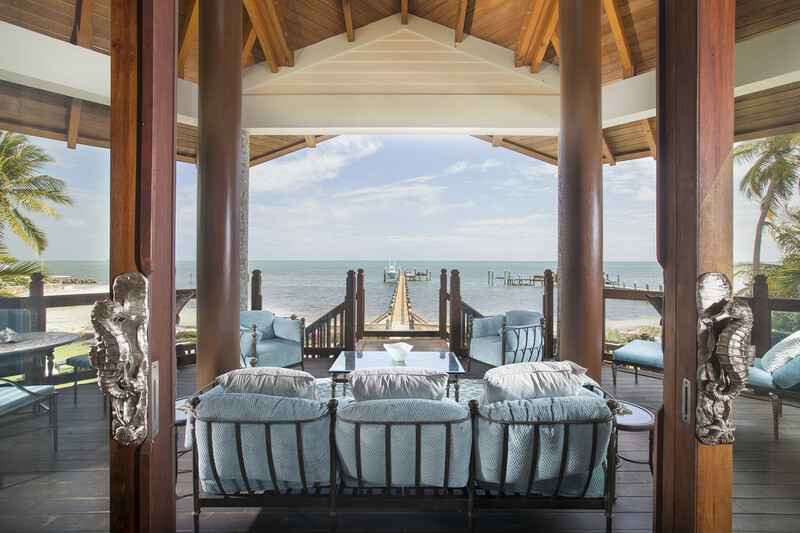 Here’s a Palladian estate in Gables By The Sea draped by Biscayne Bay on three sides asking $6.89 million. Unfortunately a number of politicians in the Miami area are making a huge deal about sea level rise “due to climate change”…including the Republican mayor of Coral Gables. Why don’t all the subscribers to WUWT put stupid offers in to buy politicians beachfront properties on the basis that their useful life is only going to be a matter of a few years and any offer will therefore seem generous. Publicising this would really make them squirm with embarrassment. Jon Landau just moved to the other side…..
That bill never became law. It never passed the House, and a similar bill that was passed in the House has not gone through reconciliation against the Senate bill. The current law is that properties that have flooded more than once may not be subsidized by FEMA as established in the 2012 law. The Left’s political spin is that Biggert-Waters would have required flood insurance premiums to reflect the real cost of flooding. That’s nonsense. It could not be further from the truth. The Left wants a small percentage of Americans — those who live near coasts and inland waterways — to pay off the cost of the federal government’s failed New Orleans levees, by paying ruinous rates for insurance, while enabling the feds to pretend to have not raised taxes. That policy is also supported by radical “green” activists who want to make coastal development economically unfeasible, by making mandatory flood insurance unaffordable. That’s just wrong. It is morally wrong, and it is bad economic policy. Federal flood insurance on coastal property in many States, like North Carolina, is already profitable, without these rate increases. Insurance rates are supposed to be based on the risks associated with the properties being insured. Raising their flood insurance rates would only make sense if the high losses in New Orleans and the profits in other States were products of mere random luck, implying that future risk to property in those States is higher than their loss history suggests. But we know that isn’t true. Most States do not have cities which are built below sea-level, behind federally-constructed levees of questionable integrity. It’s not fair to make coastal homeowners in those States bear the burden by themselves of paying for the federal government’s expensive New Orleans levee blunder, while other citizens pay nothing. Note, however, that the Homeowner Flood Insurance Affordability Act of 2014 was just a band-aid. Biggert-Waters contains many other very bad provisions, including provisions which appear to be designed to increase the cost of insurance and discourage coastal development. For instance, it has a provision encouraging, for the first time, the squandering of federal flood insurance premium money on private “reinsurance,” of the sort which has wiped out most of the reserves of the NC Beach Plan (now called the NC Coastal Property Insurance Pool). That’s just a way to siphon money from Americans, and put it into the pockets of (mostly foreign) reinsurance companies. If there’s any entity on planet Earth which should self-insure, it’s the U.S. federal government! Private reinsurance makes no sense at all for the federal government. It is a scam, pure and simple, by an unholy alliance of reinsurance companies and leftist Climate Movement activists. Biggert-Waters also has a provision directing FEMA to draw all new Flood Insurance Rate Maps (FIRMs). The new flood maps will, for the first time, incorporate “climate science” to make sea-level rise projections. Those are code words meaning that new flood maps are to be based on future, hypothetical, politically-driven predictions of wildly accelerated sea-level rise, which are thoroughly inconsistent with sound scientific analysis. It sets up a body to oversee this process, called the TMAC (Technical Mapping Advisory Council). This process will create fanciful “flood maps” which make billions of dollars worth of coastal property undevelopable, and which have nothing at all to do with real flood risk. It could end up being even a bigger economic catastrophe for coastal communities than the disastrous Biggert-Waters insurance provisions. The TMAC has recently issued a deeply flawed political report, masquerading as a scientific assessment, based on the usual unscientific projections of accelerated sea-level rise. Coastal communities and property owners should be very worried. dave, I am familiar with New Orleans and its history. The original city was not built below sea level, though it did get flooded from time to time. That flooding replenished the soil. That soil now no longer gets to New Orleans. It goes out to sea. Add in the levees, some of that soil now raises the water level in the levees. With the loss of replenishment, you also have compaction, which results in subsidence. Go visit the French Quarter. It is over 300 years old. it is, or was the last time I checked 9 feet ASL. Now go over to the Mississippi River and look at the levees. Do the same with Lake Pontchartrain. Think about the siltation going on with the residual that does not go out MRGO and/or the River itself. I would suggest an expensive media campaign throughout the U.S. election campaign that contrasts provable statements with alarmist b.s. and asks where the candidates stand. A preliminary statement about current government spending and policy might be helpful. Manhatten is basically built on a lot of schist. [ok, ok, let the puns loose, I am ready] As such it does not have much in the way of subsidence and so is a bit more reliable than say New Orleans. Not surprisingly, the envelope of the tidal gauge follows the AMO cycle. Since we are in rollover of the AMO, the deceleration of the tidal height and probably a decrease in the next 10 to 20 years can probably be expected. Haven’t they heard of indoor plumbing? The were so worried about the accumulation the first thing the current Mayor did was try to get rid of carriage rides. Manhatten might be built on schist but it is subsiding by between 1.0 mm/year to 2.7 mm2/year according to the GPS stations in the area. 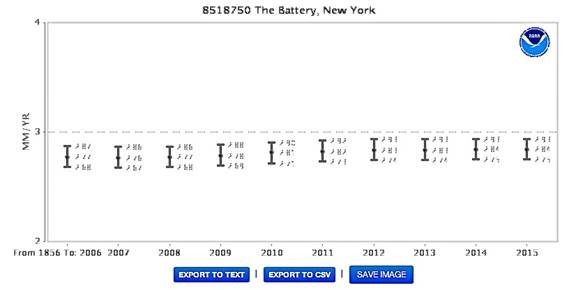 The Battery Park GPS has recently reached the level of statistical significance and it is sinking by 2.12 mms/year. Since the near-by tide gauge is only recording sea level rise of 2.85 mms/year, one must conclude the real sea level rise is only 0.83 mm2/year. Other New York GPS stations. Exactly. Fort Denison in Sydney harbor has measured 0.5 mm per annum for the last 100 years. This is more like the real number. calling pigs for supper got completely hotwhoppy. Their really isn’t an alarming increase in the land station record either. Other than that, excellent post thank you. No change in ocean pH? This is exactly why they focus on the bogus satellite gained average mean crap. Well, it isn’t bogus… But you have to adjust it a bit. 1. The GIA (global isostatic adjustment was added in 2011 because the sea level wasn’t rising fast enough. The sea floor is sinking an estimated 0.3+ mm per year so they arbitrarily add 0.3 mm/Y. There is absolutely no sane reason to add GIA since this changes a measured sea level measurement into an estimated change in ocean depth. 2. They mask the land area. Now if the sea is sinking 0.3+ mm/y the land is rising 0.7+ per year. Lets call this LIA (Land Isostatic Adjustment). The masking artificially inflates the sea level 0.7+ mm/Y. GMSL trend ~ 3.3 mm/Y – 0.3+ (GIA) – 0.7+ (LIA) = 2.2 to 2.3 mm/Y. So the satellites are measuring the same sea level rise as everyone else. They are just reporting it badly. Finland’s land uplift, surely this affects sea level for places seeing subsidence. The Irish are not fond of the English either. Those of us who are Scot-Irish even less. The good news is that in 2100 Scandawhovia will be the “California” of Europe. Sea level measurements have no value if it is not adjusted to land elevation. Everyone knows that most land in Scandinavia is rising after the last Ice Age. True, but not important if what you’re trying to do is city planning on a 25 – 50 year timescale. You just care what’s happening locally. Sea level measurements have no value if it is not adjusted to land elevation. That would make satellite measured sea level worthless because they mask out the land areas. I dont disagree, but data post data. Even so, remind we why I should be alarmed about sea level rise, doesn’t this rising of land add to sea level of everywhere else on the planet? Satellite sea level data is surely useless with this issue. Which is why tide gauges matter, yes land is rising, but a tide gauge only measures water relative to shore, where it actually matters. Mark – I eyeballed Helsinki on PSMSL.org and found that the city is rising at about the same rate as tide gauge sea level is falling. Net sea level rise is about nil it seems. Check PSMSL.org, click on Helsinki. Geo movement is under “other data”. A more careful analysis may show a net sea level rise but it would be very small. Cheers mate, I must point out subsidence is not uniform, where there is stable bedrock no subsidence is detected. levelling measurements that have been carried out in the area and as well as with the soil data. It seems land subsidence is not such an easy question. If what you’re interested in detecting is acceleration, then there’s no need to adjust for vertical land movement, in most cases. That’s because vertical land motion is usually very nearly linear over the time periods of interest. Thus, vertical land motion does not usually affect acceleration calculations. The two exceptions would be when there’re major changes in human activities (such as water well pumping) which affect subsidence, and, occasionally, earthquakes. Although the best tide gauges show a very wide range of sea-level trends, they all show the same thing w/r/t acceleration: there has been none since at least the 1920s. At most locations there’s been no detectable sea-level acceleration since the 1800s. I used the NOAA tide guage data to determine that the sea level rise in the year 2014 in these garages was 2.07 mm/yr compared to the long-term average before the update of 1.62 mm/year. Basically I took an earlier version of the database and matched up the stations between the new and old version. The earlier data had 2013 data and the later 2014. The average in the 2013 data was 1.62 mm/year while the 2014 version had 1.65 mm/year. The only way the math works is if 2014 increased by 2.07 mm/year. It is certainly higher in the latest data but is that acceleration. We really need a year by year sea level rise database in order to determine if there is acceleration. I mean one number for every single year 1856 to 2015. Melting ice has lowered relative sea levels in Scandinavia. To them the sentence “the hot rod accelerated down the street” simply means it went very fast (not faster and faster). Both the N.Y. Times and Obama know EXACTLY what they are stating…They both believe in the same Agenda…21… Only fools give them excuses ! I disagree, they are liars and get away with it because of a complicit media, it is intentional and calculated.. Ignorance and dishonesty are not mutually exclusive, Carcracking. The fact that they are habitual liars doesn’t mean they understand the science. They don’t. I agree with you, George. In science, accuracy is how close a value is to the actual thing you are trying to measure, and precision is how close one measurement is to another. So they are saying that recent measurements are lining up with each other a little better, but they don’t know if they are any closer to the truth. If you measure the exact same thing multiple times and get a totally different result every time, you have a problem with precision. If you fix your equipment or your method so you end up getting about the same result every time you measure, you’ve fixed your problem with precision, but you still don’t know if your measurements are accurate. For that, you might, for example, calibrate your measurements against a known sample. Very interesting and instructive. Thanks. We could do with a similar article about global tide gauge sea level movements up to end 2015. Has anyone got a link to the NOAA data? You mean this one? Left side. Click through and you can export to CVS. @Larry Hamblin: well-written, informative article. Thanks. 1. The current trend isn’t much different that the trend that ended in the 40s. 2. The current trend is relatively constant and if anything is attenuating. 3. The difference between LOD (length of day) studies of sea level and satellite measurements needs to be constrained. Good article. The reason the sea level charts don’t show accelerated rise is because they haven’t figured out how to adjust data to show sustainable acceleration — i.e., this is a charade that would be very hard to continue year after year. Imagine a “pause” in sea level rise acceleration? Unthinkable! Maybe they could manage it on a logarithmic graph but then you’ve lost the media and the public. Gee, I believe it’s Donald Trump, not Obama who willl be cited in history as being responsible for the “prevention” of catastrophic sea level rise. He will soon be also cooling the ECS and TCS numbers too. Federal scientists have begun preparations for Donald Trump for president! What is the term used for people who sell themselves for money? Watch for increasing numbers of papers from government agencies damping down the hype on climate change. Their more ideological confreres in universities will take a bit longer to reach the asymptote of hysteria. Then we will have only the activists not dependent on government largesse who, too, will eventually be forced to get back to saving the Nile crocodile and such. One big plus (nothing is completely negative) is the greens have come around a bit in embracing nuclear (a last ditch effort to hang on to their ideological engine, CO2). I see an ever-present dialectic among the greens and the left in general. Like cherry picking a part of a statement out of context, only half of the thought or really a completely different thought is presented and its ultimate conclusion ignored. For example, government having taken a pre-emptive stand against coal has benefited natural gas and a grudging acceptance of nuclear. However, this coal remains in its trillions of tons in the ground and certainly gas and oil will eventually peak – I won’t guess when. Coal, with its unbeatable economics (free of ideological taxes) will be back. It will share a future with nuclear for electric power and also become feed for artificial oil, gas and petrochemicals. This isn’t “might”, this is a certainty. Global warming won’t survive Trump. Without the Obama-era adjusted charts climate just looks like serial weather. Just had an argument two days ago with my neighbors girlfriend ! She claimed the melting of all the Arctic Sea Ice would flood the entire U.S.A….Nothing I said would convince this college graduate that melting ice ice floating in water CANNOT increase the the level of the water ! All she kept saying was …”97%” !! etc…etc…. When even scientists and engineers argue about the details having a sensible discussion of global warming topics is hard with people who are knowledgeable. Arguing with someone who failed or never took physics about global warming is an exercise in futility. People who are bad at math find this argument compelling. Moral: Don’t deliberately argue technical topics with the most ignorant misinformed person you can find. Sounds like the person I had an extended discussion with because she contended that there could be thunder without lightning. Very frustrating to get the blank stare when you try to explain what thunder is and how it is caused. I went through that with a bunch of high-schoolers, although they could admit that Arctic ice cap floats, unlike Antarctica, the continent. So I did a little show-and-tell a week later while serving them some illegal beer and grilling burgers. Hauled out my 12-inch stainless steel mixing bowl and the wide-mouth gallon pitcher we solar-brew ice tea in. The pitcher was full–warmish water, it was a setup. And a small bowl of my monster ice cubes for my medium-quality bourbon. I got Mr. Loudmouth (McKibben-lite) to pour the water into the bowl, then put the ice in the water. I said, Here, have another beer. Took the ice almost an hour to melt, even outside. I said, Okay. Who’s going to measure it? Here’s the funnel. Loudmouth’s BFF did the honors. They all sat there in silence at the result. I said The arctic ice melting is going to flood exactly nothing. ..Fox News is fighting back too ! I cannot believe that report offered “potential” events, but did not assign probability because it is too complicated to make accurate predictions. Why mention possibilities at all if you have no clue what will happen? For heaven’s sake, I could potentially marry Brad Pitt (we are both alive), but the probability of that happening is 1.0 x10^-infinity. Making plans for the AllyKat-Pitt wedding would be as much a waste of time as local coastal governments making plans using the assumption that the local sea-level will rise 3 feet by 2100. Actually, those wedding plans could be adjusted for use with another groom. AGW-inspired planning loses by a landslide. Again. Is there ocean floor lift\subsidence anomaly data? The Himalayas are rising by about 1cm/year but eroding at about the same rate. in the 2015 one are we seeing El Nino thermal expansion? Well, that is the question. 1998 had a drop afterward. 2015 was really a two year El Nino. The prediction envelope is for a moderate La Nina. The global temperature and sea level should decline, the million dollar question is how much. How could that be when the thermal aspect of el nino is a near surface phenomenon? More likely the sea level change is a function of the reversal of prevailing winds that bring warm West Pacific water Eastward to N.A. How could that be when the thermal aspect of el nino is a near surface phenomenon? The El Nino is moving water from left to right so the rise is accurate. The 2015 El Nino had about a 5 mm impact on sea level (from eyeballing one of the charts above). If you assume that the effect only goes 100 meters deep and only affects 1/3 of the worlds oceans, the affected area rose 15 mm. How much warmer does 100 meters of ocean have to be to expand 15 mm? T = 15 mm /(100,000 * 333E-6) = 0.450 K.
Do I think an El Nino warms the surface waters almost 1/2 of a degree Celsius? Sure – because that the is definition of an El Nino. destroyed any catastrophic theory of sea level rise. Even better are the ~70 long record tide gauges with reasonable diff GPS land motion adjustments. They say about 2.2mm/yr, and no change for the last century. Takes the land motion stuff out of the assessment. Do you have a reference for that, ristvan? When I last looked, a couple of years ago, the CORS data quality appeared to be very poor. 1) Most think the ice ages were millions of years ago, and they do not realize that we still live in one that has lasted for almost 3 million years. 2) Most think that climate is static, and that any rise in global temperature should be a concern, particularly if man is responsible for it. 3) Most think that sea levels are also static and that any rise in sea levels should be of great concern, particularly if man is responsible for it. 4) Most are quite susceptible to media propaganda..
>i>Most are quite susceptible to media propaganda.. Particularly if man is responsible for it. Almost anything perceived in others will eventually be revealed within ourselves. Valuable article. I had been looking for a presentation of this data in one place, and here it is. I see that Larry Hamblin has managed to include a couple of potshots at President Obama. To me these seem well-deserved and in fact my eyes tend to glide right by such stuff while I focus on the data. But including such sniping at the president makes it almost impossible to share this sort of piece with some of my friends. When they read an article like this the information they absorb is the inverse of what I get. They see it as essentially a partisan attack and assume that all the data is worthless (despite coming from NOAA). Consider this a plea to write more objectively in the future. So just show them the data. President Obama has significantly damaged the scientific integrity of all government and government funded science by making these endeavors the slave to his political ideology. He has made invalid climate alarmist remarks from the bully pulpit for years and never been held accountable particularly by the Obama loving press. He has misdirected hundreds of billions of dollars in pursuit of climate alarmist folly which could have been used to address the countries real problems with poverty, education and continued economic stagnation. Will anyone ever hold him and his admirers accountable? My article is hardly political to point out his clear ignorance of climate science issue. President Obama has badly damaged the integrity of all government and government funded science by making these endeavors the salve to his political ideology. He has made numerous climate alarmist claims that are clearly erroneous and shouted them from the bully pulpit for years and never been held accountable for this abuse of scientific truth by the press. The Obama loving media has not only given him a pass on his absurd and erroneous climate alarmist statements and political interference with the nations scientific pursuits but has supported both his actions and claims which have so damaged the conduct of sound scientific inquiry in the U.S. He has misdirected the use of hundreds of billions of dollars in his climate alarmist folly and precluded these funds from being used for the nations critical issue regarding poverty, education and improving the continuing economic stagnation. My comments in this small article exposing his clear ignorance of climate science basic information taken from on his own ridiculous statements, which were never addressed by the media, is hardly political. Someday perhaps someone will have the courage to hold this President, who has so badly politicalized and damaged the pursuit of science, accountable for his folly. Let’s see? Could that be because he reflects the current thinking in the field by the overwhelming number of scientists? Can I be sold bold as to say that is entirely responsible given he is not a scientist and so he listens to the people who study the stuff. Unlike Trump who thinks climate change was invented by the Chinese. Mr. Simon I have bad news for you. What scientists “think” isn’t measured data. The data doesn’t support climate alarmist “thinking”. When the measured data shows otherwise the “thinking” is wrong and the alarmists claims are disproven. But the “measured data” supports Obama’s stance too. Two hottest years in modern history (and we are heading for a third), the arctic in poor shape the the antarctic not much better. Funny how Trump says climate change is a hoax and at the same time says it’s real and the reason for his needing to build a wall at one of his golf courses. Now there’s a man who will say and do whatever he needs to to get what he wants… as opposed to what’s right. If I had a dollar for every time Simon repeated his Appeal to Authority logical fallacy, I could buy a mansion next to Algore’s. Besides, as I’ve pointed out dozens of times: the true ‘consensus’ (for whatever that’s worth in science; not much) is heavily on the side of skeptics of the AGW scare. Simon asserts a consensus, but he can’t produce names. I can post the names of tens of thousands of professionals, all with degrees in the hard sciences, who have stated in writing that human emissions are most likely harmless, and beneficial to the biosphere. Skeptics are the consensus. I can produce names. Simon can’t. Case closed. Great let’s see your list? But DB not the Oregon Petition please. It’ nearly 20 years old and so 20th century. You still haven’t produced a single name. You just deflected, as usual. And as you are well aware, the OISM list of names is online. Your argument that it’s 20 years old is as big a FAIL as all your other failed arguments. In science, facts don’t lose their credibility because time has passed. But thanx for demonstrating that you’ve got no argument — and of course, still no names of any scientists who contradicted the OISM co-signers. So you fail the challenge. And your ridiculous list of unqualified ‘authorities’ shows just how desperate you are. Tell us, Simon, how extensive is climate research in the American Academy of Pediatrics, or in the College of Preventive Medicine, or the Canadian Society of Soil Science, or the Institution of Mechanical Engineers, or in the World Association of Zoos and Aquariums? heh. And what do you think of your hero Trump who calls climate change a hoax and then uses it to get permission to build a retaining wall on his golf course? I mean, that has got to be the height of hypocrisy… doesn’t it? Mr. Simon you misunderstand and mischaracterize the global temperature data. The last years have been higher in temperature because of the very large 2015- 2016 naturally occurring El Nino as clearly shown at (https://wattsupwiththat.com/2016/05/25/climate-models-dont-work/). Climate alarmists consistently conceal the El Nino force as driving the recent global temperatures and temperature trends. Climate models that supposedly represent that CO2 emissions drive global temperatures have failed and grossly overstate the impact of atmospheric CO2 levels on global temperatures as addressed in detail in the referenced article. The climate models don’t work and the data shows it clearly. Obama’s claims as always conceal the failure of the climate models, the significance of the El Nino event on recent global temperatures and of course the failure of NOAA tide gauge data to show coastal sea level rise acceleration. Additionally Obama fails to inform the public that the U.S. is not a contributor to growing global CO2 emissions as addressed here: (https://wattsupwiththat.com/2016/05/24/the-latest-eia-co2-emissions-data-shows-that-the-u-s-is-not-a-significant-contributor-to-increasing-global-co2-emissions/). The free market energy impacts of low cost natural gas from fracking has overtaken any need for heavy handed and costly government programs to reduce U.S. CO2 emissions. Of course President Obama conceals this information from the public. El Nino has no effect on the long term trend. Take El Nino out of the picture there is warming. Put it in…. there is warming. Focus only on La Nina years… there is warming. Bottom line El Nino and La Nina have only a short term influence. Enso is not the driver and never has been. And it seems to me your flimsy grasp on the science is driven by your love of the free market. Sadly a condition many here seem to suffer from. The global temperature graphs provided by climate scientist Dr. Judith Curry at (https://wattsupwiththat.com/2016/05/25/climate-models-dont-work/) clearly show the impact that El Nino events have on long term global temperatures and temperature trends. Try looking at some actual measured global temperature trend data and observe where the El Nino events come unto play. It might open your eyes a bit. So I produce mine… you produce nothing…. I guess the case is closed. I’ve repeatedly challenged you to produce the names of scientists and/or engineers who dispute the OISM statement. But you’ve never posted a single name. I can produce the names of more than thirty thousand professionals, all with degrees in the hard sciences, including more than 9,000 PhD’s. Can you produce even thirty (30) names of professionals with hard science degrees, who have contradicted the OISM statement in writing? I didn’t think so. But prove me wrong, if you can. That will be a first. yes El Nino are the peaks and guess what, La Nina’s are the troughs. But … hello… they are not the long term drivers. If they were we would have been getting hotter for a very long time and would have fried quite some time ago. Your “logic” is as big a failure as your “appeal to corrupt/irrelevant ‘authorities’ fallacy. So I produce a list that has pretty much every scientifically representative national body on the planet and you produce…. wait for it…. a nearly twenty year old list called the Oregon Petition. It was a highly dubious when it was produced, but that is even irrelevant now. It is an out of date worthless piece of history. DB, why do you allow yourself to be set up like this? Believe what you want. Doesn’t make it right. Saying El nino contributes to long term warming is like saying you can lift yourself into the air by pulling on your shoelaces. Mr. Simon the expert analysis of climate scientist Bob Tisdale regarding global temperatures as documented by numerous books on the subject and his clear analysis and discussion of the long term global temperature and temperature trends impacts of El Nino’s, which you have tried to deny, isn’t “belief” but solid science. Solid science is something foreign to climate alarmist “believers” who base their beliefs largely on deception and distortion of information as propagated by the media to try to manufacture and exaggerate something that isn’t a crisis. The schemes to push climate alarmism are part of a massive government and media political campaign supporting the views of a President who is clueless about climate science and driven completely by a scientifically unsupported ideological. The “truths” about climate science which include the facts that the U.S. is not contributing to growth of future global CO2 emissions thus negating the need for heavy handed and costly government mandates to address future emissions, that climate models have failed and been proven to grossly exaggerate and overstate global temperatures therefore demonstrating these models are inappropriate for climate policy action, that global temperatures and temperature trends are largely driven by natural climate variables including recent strong El Nino’s and that despite decades of alarmist speculative claims otherwise coastal rates of sea level rise are not accelerating. In the end solid science backed by reliable measured data will win out over the tactics of deception and distortion, lead by the efforts of President Obama, that have so dominated the scientifically unsupported political campaign of climate alarmism. Oh dear. Tin foil hat anyone? From the Bulletin of the American Meteorological Society we learned that a 2009 survey found most broadcast meteorologists say that they disagree with the IPPC claim that humans are primarily responsible for recent global warming. A 2010 survey of all American broadcast meteorologists by researchers at George Mason University confirms that result. Hundreds of highly qualified scientists have signed The Manhattan Declaration On Climate Change, declaring their belief that global warming is not a crisis, and CO2 is not a pollutant. The June 2013 newsletter (TAG 167) of the Geological Society of Australia (GSA) illustrates the ongoing lively debate in the scientific community about anthropogenic climate change. In 2009, the GSA’s Executive Committee issued a statement in support of global warming alarmism, but they subsequently withdrew it due to intense criticism from the Society’s members. On p. 9 of the June 2013 newsletter you’ll read that in 2010 an independent poll of GSA members found that 53% disagreed with the Executive Committee’s 2009 statement. So, in 2012, the Executive Committee tried again. They drafted a new, more balanced position statement (from TAG 165 pp. 6-7), more accurately reflecting the Members’ beliefs. But the Society’s members were so divided on the subject, and the debate was so rancorous, that they finally gave up on trying to reach a consensus. That’s why the GSA takes no position on climate change. OK so I started reading then saw you were quoting the Heartland Institute. Maybe a ship load of tin hats is needed. That was a truly despicable comment. Pure ad hominem. Your ‘consensus’ argument has been totally demolished. There’s nothing left of it. But instead of being a stand-up guy and admitting Dave Burton thrashed you with facts and evidence, you deflected onto ‘Heartland’. But I’m glad you made your comment. It proves that as usual, you’ve got nothin’. Simon, the Heartland Institute is one of the world’s finest public policy think tanks. If you don’t realize that, maybe you’re the one who wears AFDBs. Or perhaps you were misled by the Peter Gleick / DeSmogBlog forged document smear. If you’re not familiar with the story, read on. Dr. Gleick tried to anonymously distribute a “strategy memo” purportedly leaked from Heartland, which was actually a forgery, almost certainly created by Gleick, himself. Here’s an article about the affair, in The Atlantic. Gleick was subsequently rewarded for his crimes by National Geographic’s ScienceBlog subsidiary, where he’s now their resident “scientist, innovator, and communicator” on global water, environment, climate, identity theft, fraud, character assassination, and forgery. Unfortunately, someone who dismisses the Bulletin of the American Meteorological Society and George Mason U. simply because they were quoted by Heartland is probably not open-minded enough to learn from Heartland’s resources. That kind of ad hominem nonsense is from the same kind of non-thinker who actually believes that the Canadian Society of Zoologists, and the American Academy of Pediatrics, and the the World Association of Zoos and Aquariums are the go-to experts on “climate change”. Heartland is a right wing think tank that does little more than spread propaganda about issues that threaten the free market. Tobacco regulation and mitigation against climate change are two areas they have thrown a lot of effort into producing misinformation. Clearly they have had some success if you believe they have credibility. In my world though they are the lowest of the low, happy to spread their nonsense so they can keep the money rolling in. All the time people were dying from smoking and they cheerfully called the (now proved beyond doubt) research phoney. No self respecting scientist would have their name anywhere near theirs. So when I read you (Dave B) were quoting them, I stopped reading. Life is too short. To Simon, either first name or last which ever your trying to hide, there is a great article at (http://hockeyschtick.blogspot.com/2016/05/dr-willie-soon-takes-on-bill-nye.html) which describes you and your comments perfectly. “True science requires that data, observations and other evidence support a hypothesis – and that it can withstand withering analysis and criticism – or the hypothesis is wrong. Boy this shoe sure fits you regarding your comments. You should be so proud! Change scientism to skepticism and you are 100% correct. Could not have written it better myself. I mean what laugh the likes of DB and yourself claiming the facts are on your side…. Read the facts by one of the most prestigious scientific organisations on the planet…. Now tell me you have the facts to win this debate…..
Read the facts by one of the most prestigious scientific organisations on the planet…. The Royal Society has yet to be right about most of its top-level politically-inspired decisions. And that goes back to its founding members: Newton’s astrology, The lunar position tables and longitude vs the chronometer, physics predictions in the late 1800’s, opposition to tectonic theory, support of ether, choice of naval gunnery computers, germ theory-infections-water supplies, plumbing, blood-letting, opposition to nuclei theory of the atom, to fission, to fusion in the sun, to elements in the sun …. I’ll leave you to decide which of the two groups that joined forces to write the document that destroys your “we have the facts” argument, is the most prestigious? I visited the beach in front of SIO in 2005. I used to bodysurf south of the Scripps pier and spearfish north of the pier in 1975-82. The surf line had no discernible change in 30 years (same for the La Jolla Shores surf line). I’ve been visiting San Francisco’s Ocean beach since the 1970’s. There is no discernible ocean incursion onto the wide beach, as in if there has been sea level rise, it has been minuscule. I trust my observational judgment. I feel confident that if a substantial sea-level rise had occurred in 30-40 years, i would have noticed it. I started doing science observations and experiments at age 5 when I started catching and collecting insects, and identifying them, as well as bird species. A age 8 I received a football for Christmas, but never used it, while I did spend my Christmas money to buy a microscope, which I used a lot, more Xmas and B-day money spent at age 10 to buy a Newtonian reflector and chemistry set. I got to work with electron microscopy at age 19, then at age 22 did some early bimolecular engineering. I was also a National Merit Finalist, and graduated 3rd in my class at Berkeley, double majoring in 4 years. Then you have not-even-credible “scientists” like Hansen (conflating Venus with Earth, PhD in Physics at Iowa, okay Van Allen, but Van Allen sent his top undergrads to MIT et al. Only his crappy students stayed at Iowa. Then Berkeley undergrad Mann, couldn’t get into PhD Physics at Berkeley, Caltech, Stanford, Harvard, MIT or Princeton, or even Chicago or Cornell. He went to Yale, a place that had ZERO Physics Nobel Laureates, but even then, physics was too hard for him. Switched to geosciences. Took 9 years working straight through to get his doctorate (after 5 years for his AB), only after doing research at U Mass–perhaps the first Yale degree issued for research not done under a Yale professor. Then you have Phil Jones, EAU, graduate of UK third tier U. And these are people who are changing science. Not to mention Blondie, former Science Editor-in-Chief, now NAS prez, who is the first Science EIC, and NAS prez with a bachelor’s from a 2nd tier humanities college. Real sea level rise is measurable in inches per century. If humans can’t deal with that, humans aren’t as smart as they used to be. I’m not quite sure why you felt the need for such a public mea culpa, admitting that the guttersnipes and underlings have taken you and your learned whizkid peers to school for the past couple of decades. The likes of Schmidt and Hansen have kept you and your übermenschlich pals silenced, “getting along” (but keeping your job?) while the little petty tyrants took the science world apart. Who knows, you’re still alive, so maybe you and your “esteemed” pedigreed cohorts will figure out that the only way that you’re ever going to really amount to anything is to grow a pair and step up and do the right thing and put an end to this! I agree with you. I sold out. I bought into a corrupt scheme that promised intelligence, hard work, and delayed gratification, (also no drugs or EtOH), could protect me from living on the street, or dependent on government welfare. Now let’s consider the “environmentalists” (whatever that means) who say that Central Valley Farmers are grabbing 80% of the water produced by the Sacramento River. By which they mean 30-40% of the Sac River’s actual capture and diversion from flows to the Pacific Ocean. Alan, you’re right. Except for the “shut up”. I learned that working hard, doing grueling jobs, studying hard when other students were partying, delaying gratification, were worthwhile. How about yu?. Did you ever mow people’s lawns and weed their bedding-plant yards at age 10-12, or pick strawberries, or transplant celery, or weed, cut or load lettuce cartons age 14-19? Did you? Because only Mexicans will do that. Ignoring some Anglo-American youth. What hard, grueling physical jobs have you done in your life? If none, then I don’t say to you, “Shut up”. But I can conclude you have no credibility. I did jobs that fed other people. How ’bout you Alan? Choosing tide gauge data derived from stable regions (not influenced by techtonics or isostatic rebound), generally shows < 2mm per annum increase. Would it be fair to suggest the satellite data is reading too high ?. Sydney AU shows 0.65mm with an error margin of 0.1mm. So the “real” satellite sea level is 2.3 mm/Y or less. PA, do you have any links explaining the 0.7mm adjustment.?. The ocean floor is dropping 0.3 mm/Y. (the justification for the GIA) adjustment). Further, they claim it is greater than that but they are being conservative. Read their explanation. The land is rising and the ocean is sinking because of magma flows. 7/10 of the planet is sinking 0.3+ mm because of magma flowing to the other 3/10ths of the earths surface. 0.3+ * (7/10) / (3/10) = 0.7+ mm. The magma isn’t flowing into the atmosphere, it is flowing under the land and the volumes have to be equal. You can test this at home with a cup and a cork or other solid object 3/10 the area of the cup and is slightly buoyant . You don’t have to take my word for it. Just lift the solid object and measure how much you have to raise it for the water to drop 0.3 mm. UC esplicitly states that they mask the land area. That means a 0.7+ mm/y uplift is reported as 0 (zero). Further they add 0.3+ mm to account for the sinking of the ocean floor which has absolutely nothing to do with sea level. Lets say the land wasn’t rising just the ocean floor was sinking and the tidal gauges were reporting 0 (zero) sea level rise and in point of fact there was no actual sea level rise. How much would UC report? 0.3 mm/Y. For the real story on NY City Relative Sea level, see my essay re Hurricane Sandy. The only sea level pertinent to human affairs is LOCAL RELATIVE SEA LEVEL — the level at which the land and the sea meet. For most places, it is the level between High Tides and Low Tides, with some attention to highest possible tides — coupled with the local geography/bathymetry (land features and sea floor “geography”) that help predict the effects of storm surges. For instance, Tropical Storm Sandy’s effects on NY City were greatly increased by the restriction of access to the Meadowlands — the historic flood plain for NY Harbor — access to the Meadowlands for storm surge waters have bee cut off by development. Didn’t Hurricane Sandy also coincide with a “Spring Tide” – much higher than normal high tide? Reply to J. Philip Peterson ==> Yes, it was the “Perfect Storm” of storm surge plus extreme high tide plus years of forgetting how high the water could come if you don’t allow the Meadowlands to act as a natural relief valve. It would take some historical sleuthing to find the last time that the Meadowlands was able to perform this function successfully to ward off disaster. Right on, Kip! I guess you’re not related to James. Obama needs to take a lesson from King Cnut. and it would be silly to assume that average rise didn’t mask centuries of above and below that mean outcome, so much so that it could easily dwarf the global 1.6mm a year estimate today. What planet do these doomsayers live on when faced with such evidence or are they denying the science? Now the scramble will begin to “homogenize, smooth and adjust” data to get the desired results? You have a nicely written and well researched article, so I’d like to thank you for that. Yet it seems you have a basic misunderstanding of the science behind sea level rise. The rise that you cite in your article (the inches we’ve seen) is due to a combination of melting of high altitude glaciers and warming oceans. Both are caused by climate change, which is in turn linked to (mainly) human emissions such as carbon dioxide and methane. The sea level rise that’s estimated by scientists for mid and late century are based on the collapse of large land based ice sheets, mainly in Greenland and Antarctica. So far, the land ice in those areas have not seen significant decline (though they have declined, most of the decline had been in sea ice that had no effect on sea levels). So, in short, your conclusions don’t take into account all of the facts of the situation. That said, there is some debate about how much of the land ice will melt. If we continue on like we aren’t causing any harm then it’s likely we’ll see rise on the middle to high side of estimates. If we take action, we can still likely stave off the more dire effects. Finally, you don’t really mention how detrimental even a few inches of sea level rise can be. Florida is already witnessing the effects of higher sea levels, and we’ve not even seen that much of a rise yet (as you’ve made clear). and you realize the sea level has dropped a couple of meters in the last 4-5000 years? How devastated was the world back then? 1) You spent a great deal of time trying to convince the reader that you have greater expertise than the author, even claiming that the author omitted relevant facts, then you used Florida’s issues as an example. 2) Your call to action was a factually wrong and logically weak invocation of the precautionary principle. Even NASA is no longer supporting the claim that Antarctica is losing ice mass. What Florida is seeing, Eric, is something it has seen for 22,000+ yrs. The sea level has been rising before man-made CO2 emissions, and as the data here shows, it has not accelerated since man-made CO2 emissions started. And I assume by Florida you mean Miami, because I don’t see any other areas of Florida reacting to anything about sea level rise. A big issue has been made of “King tides” in recent years at Miami Beach, failing to note that local variations occur but are balanced-out over larger periods of time. When you talk about local areas, you need to consider other aspects, such as subsidence due to the withdrawal of groundwater for drinking and irrigation use. As far back as 1976, municipal withdrawals were up to 345 million gallons per day (mgd) in Dade County and an average of 155 mgd in Broward County. Both groundwater and freshwater canal levels have dropped over the past 20 years despite a flat trend in annual rainfall. Take a look at places like New Orleans and Houston where the rate of subsidence due to groundwater withdrawal can be 10-100+ times the rate of sea level rise. And subsidence is what in your theory of everything, Dr. Eric? For three decades now we have been bombarded by climate alarmists with speculative claims of melting glaciers, melting Greenland, melting Antarctica (which is wrong Antarctica is gaining ice (https://wattsupwiththat.com/2015/11/05/yet-another-study-shows-antarctica-gaining-ice-mass-accumulation-highest-we-have-seen-in-the-last-300-years/ )), melting everything, etc. all of it supposedly accelerating the rise of the world’s oceans. Global tide gauge data worldwide (NOAA and PSMSL) shows no coastal sea level rise acceleration anywhere. Florida NOAA tide gauge data shows no coastal sea level rise acceleration just the same unchanging rates of sea level rise for more than 100 years for the longest period data records. We are being scammed. Eric, if “The rise [in sea-level is] caused by climate change, which is in turn linked to (mainly) human emissions such as carbon dioxide and methane,” then how do you explain the fact that there’s been no acceleration in rate of sea-level rise since the 1920s? Despite a 30% increase in CO2, and a 75% increase in CH4, the rate of coastal sea-level rise hasn’t increased at all. Every high-quality, long-term measurement record of coastal sea-level shows that fact. When CO2 was under 308 ppmv and CH4 was 1.0 ppmv sea-level was rising just as fast as it is now, with CO2 at 400 ppmv and CH4 at 1.8 ppmv. All that anthropogenic carbon has caused no increase in the rate of sea-level rise. The wildest high-end estimates for 2050 are for less than 2 °C of warming. A more likely number is somewhere between 0 and 0.5 °C. Such modest warming doesn’t necessary raise coastal sea-level. If you melt more glaciers, without simultaneously increasing snow deposition, that will raise sea-level. But we know that reduced ocean ice cover does increase snow deposition on nearby ice sheets, which reduces sea-level. Temperature increases do not necessarily melt ice. Increasing the temperature in Antarctica from -57 °C to -56 °C will not raise sea-levels. Neither will increasing the sea surface temperature in the mid-Pacific from 17 °C to 18 °C. Neither will increasing the temperature of the Gobi Desert, or the temperature of Hotlanta. If you want to know what happens to sea-level as a result of the tiny warming effect of CO2, you need to look at history, and what history tells us is that anthropogenic CO2 doesn’t significantly affect sea-level. “Mainly?” The Laurentide ice sheet is gone. In order to melt ice you’ve got to have some ice to melt. Greenland and Antarctica have the only remaining large ice sheets. Contrary to what you might have seen reported on PBS, neither Greenland nor Antarctica are showing any signs of ice sheet “collapse.” Neither would be endangered by a 2 °C or smaller temperature increase. Greenland is losing ice mass, but slowly — probably about 50 cubic miles per year. (Estimates vary, but it’s almost certainly between 25 and 75 cubic miles/year.) 50 cubic miles sounds like a lot, but it’s only enough to raise sea-level by about 0.5 mm. 2. He’s growing his barley at ~400 ppmv CO2, which makes barley (and other C3 plants) grow grow considerably faster and mature slightly faster than they do at the ~280 ppmv level which prevailed 8-10 centuries ago. Since, in spite of those disadvantages, the Norsemen nevertheless managed to successfully cultivate barley, they must have enjoyed either a substantially longer growing season, or else warmer temperatures (which speed up the growing cycle), or both, compared to Greenland today. Antarctica might not be losing any ice at all. Ice accumulation and loss are very, very close to being in balance in Antarctica. Based on GRACE, Shepherd 2012 concluded that Antarctica ice mass change since 1992 has averaged – 71 +/- 83 Gt/yr, which means they couldn’t tell whether it’s actually gaining or losing ice mass. Based on CryoSat, McMillan (2014) found Antarctica is losing 79 to 241 Gt/yr of ice, though that’s based on only 3 years of data. The range from those various studies, with error bars, is from +170 Gt/yr to -241 Gt/yr, which is equivalent to just -0.47 to +0.67 mm/yr sea-level change. That’s equivalent to less than 3 inches of sea-level change per century. In other words, although we don’t know whether Antarctica is gaining or losing ice, we do know the rate, either way, is so tiny that it’s having a negligible effect on sea-level. What’s more, the bulk of the anthropogenic CO2 pulse is likely to last only a few hundred years, which is far short of the thousands required for equilibrium ice sheet response. Why is there a green triangle over Timor? “Global predictions are for the rate of change to increase, such that by 2100 sea-level will be between 9 and 88 cm above the 1990 global average sea-level”. Looks like the global map on NOAAs website shows mostly green arrows (0 to 1 ft per century). Lol. That’s not very alarming, in my humble opinion. Curry quote appears to be off-key. I would guess the number to be +2.4 mm/year. Am I missing something? The alarmists should go back to 1250 AD Holland and ask the Dutch how they managed to live in a town 22 ft below sea level. The network of dikes dates back to 1250. The Dutch literally drained the Zuiderzee bay with pumps and reclaimed an area 24x larger than Manhattan. They also created the artificial Palm Island in Dubai. If alarmists tell Dutch engineers the Statue of Liberty is threatened by rising sea level, the engineers just might reclaim and expand Ellis Island to form the face of Mickey Mouse laughing at the alarmists. From when? and on a longer scale isn’t sea level dropping? In parts of Canada and Scandinavia it is (due to PGR). Not in most places, and not in Florida. I sorry daveburton you asked me so I will be serious for once, Pull my finger!! Yes, most of the Florida tide gauges are seeing +2.something mm/yr of sea-level rise. Vaca Key looks like 3.5 mm/yr, but that’s based on only 44 years of data, which is really too short to deduce a robust trend from a single tide-gauge record. Clearwater Beach looks like 3.4 mm/yr, but that’s based on only 42 years of data, which is even worse. All the Florida gauges with at least 50 years of data show trends between between 1.9 mm/yr and 2.9 mm/yr (7.5″ to 11.3″ per century). Though SIO in La Jolla has eagerly capitalized on the CAGW scare for much funding, no plans whatsoever have been made to move the original seashore campus up the hill and out harms way for rising sea level. Moral: watch the actions, not the words.